I had the watch in the picture serviced and is now working great! I am looking to replace the broken crystal as shown in the picture. 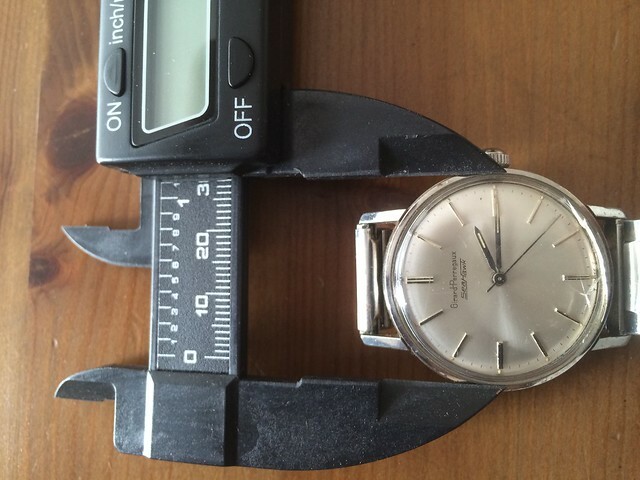 I am trying to find an original (hopefully NOS) replacement crystal for which I have attached a picture (and URL below) for a calipers measure of the crystal. Is whats in the picture the correct way of measuring the crystal to find a replacement ? It appears that the diameter of the crystal is about 26-27mm, does that sound right ? if so, is there a range of crystal diameters that would/could work as a replacement ? I need to know what crystal size I would need. I would assume that the crystal from watches in these era were plastic not sapphire, right ? (Post edited - please see the Sticky post regarding watch parts - thanks, Moderator).